We always come away from Eve's seminars feeling seriously inspired - and her guide to the key visual merchandising trends of 2015 promises to be a real must-see. As the driving force behind independent retail consultancy Metamorphosis, she's worked with some of the industry's leading brands. This season, she'll share her insights with Bubble, showing you how to create a retail environment that wows customers - and compels them to buy! 2. Henry Patterson, Not Before Tea. Henry Patterson is no ordinary schoolboy. At just nine, he founded Not Before Tea, a unique children's brand specialising in traditional sweets, games and gifts. He's since written a book, The Adventures of Sherb and Pip, and opened his very own bricks-and-mortar store. Indeed, when he's not appearing on the One Show, chatting to Richard Branson or designing his own products, Henry can be found manning the till - with a little help from imaginary friends Mrs Pinny, Sherb the Owl and Pip the mouse, of course. This February, the remarkable young entrepreneur will share his story with Bubble. Eat your heart out, Richard! Catch not before tea in Bubble Gum. 3. Joanna Brasset and Lisa Johansson, Studio INTO. After meeting at Central St Martins College of Art and Design and pursuing separate careers, Joanna Brasset and Lisa Johansson founded Studio INTO together. A research, design and innovation consultancy, it creates business strategies based on real social trends. During their seminar, the dynamic duo will discuss the changing role of grandparents - before looking at how brands and retailers alike can respond to it. Don't miss their fascinating insights, which could help you to identify and reach new customers. 4. Melanie Lester, TM Design Studio. Melanie Lester is CEO of TM Design Studio, an innovative new trend forecasting company. After studying for a BA in Fashion Promotion, she spent five years at the renowned Mudpie – and now works alongside some of its lead creatives. Melanie’s seminar will see her introduce three key Kid’s Wear trends for A/W15, focusing on colour, graphics, prints, garment silhouettes, retail and styling. Kim Mannino is Director of Trend Services for WGSN, and an unrivaled authority on all things cool. This February, she will share her must-see A/W15 trend forecast with Bubble, pinpointing the season’s hottest prints, colour palettes, materials and silhouettes. The founder of brand creative and digital collective Fist of Fury (yes, it is named after a Bruce Lee film! ), Martin excels at demystifying digital marketing. This season will see him introduce the R.A.C.E planning tool, which helps businesses to develop their inbound and digital marketing strategy. If you're looking for no-nonsense marketing advice, Martin's your man! 7. Jim Jordan, The Coaching Solutions Toolbox. Back at Bubble by popular demand, Jim Jordan is a highly-regarded business coach with over 35 years of industry experience. After a successful career in retail, he founded The Coaching Solutions Toolbox - and now helps businesses to create tailored growth plans. This season, he will be sharing his step-by-step guide to preparing, developing and delivering strong business performance. Fancy hearing more from our expert speakers? Register for a free ticket to the show here. 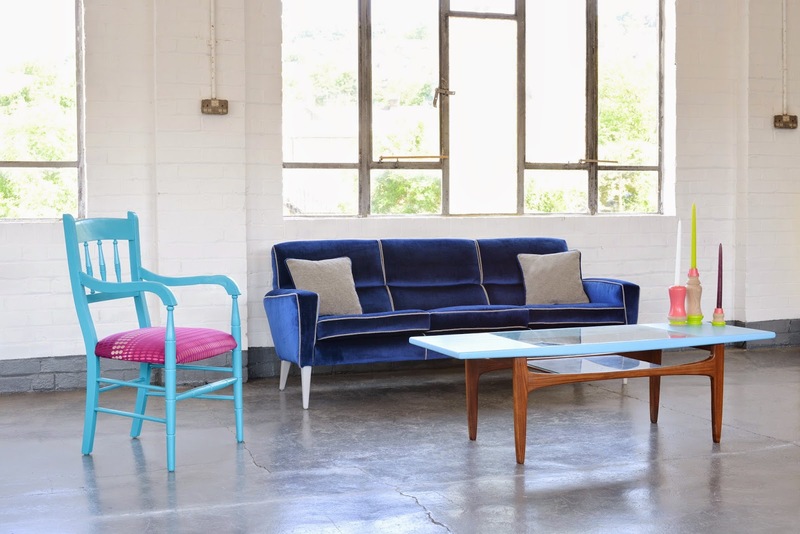 This season, Bubble has teamed up with High Wycombe's Out of the Dark (OOTD), a charitable social enterprise which creates unique, upcycled furniture. 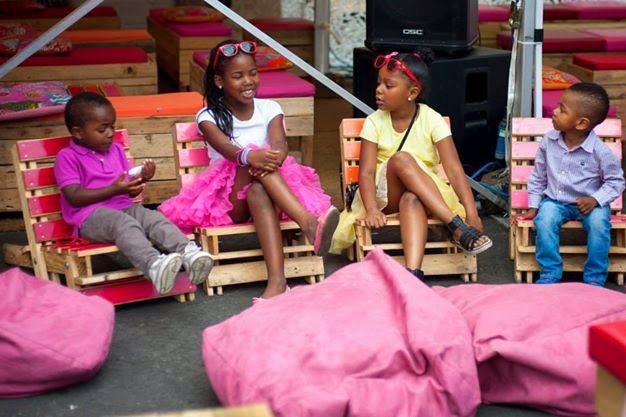 Founders Jay and Jade Blades employ disadvantaged young people, teaching them how to restore, reupholster and completely revamp unwanted pieces. The charity will be helping to furnish our February show - and, when Jay offered to hold an upcycling workshop for friends of Bubble and Speak, we jumped at the chance! But who to invite? We swiftly assembled a crack squad of creatives, including Kid Style Junkie's Suzanne Peters, Little Scandinavian's Bianca Wessel, City Kids' Victoria Evans, Natalie Lee of Style Me Sunday, illustrator Sophie Crichton, Upcyclist's Antonia Edwards, Collezioni's Peppe Orru, stylist Fran Lee, photographer Sonya Hurtado, and interior designer, writer and blogger Ashlyn Gibson. The workshop was held at Shoreditch's Pitfield, a cafe, shop and gallery brimming with unique homewares. In this suitably creative setting, Jay and OOTD craftsman Luke set about teaching us how to upcycle an old school chair. 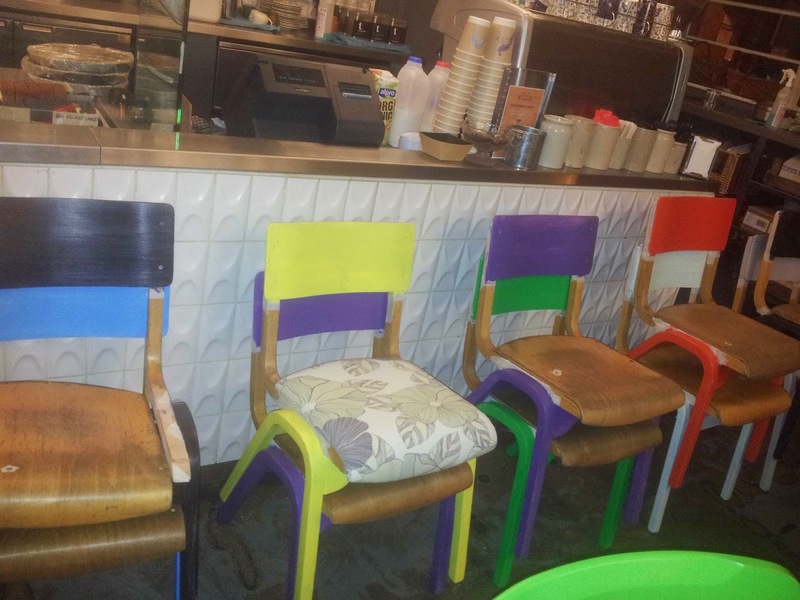 After a crash course in painting and upholstery (top tip: don't staple your fingers), it was time for the really fun bit - choosing our chairs, and beginning to revamp them! We painted our chair frames (armed with plenty of wet-wipes for drips), before using super-strength glue to attach padding to their seats. OOTD work with donated fabrics, and had brought along a range to choose from. Each creative selected a piece of material, which would be used to cover their chair seat - although upcycling veteran Ashlyn had come equipped with her own. Nevertheless, most of our creatives were soon stapling away like OOTD professionals - and even had time to add a few finishing touches. Ashlyn's chair featured an in-built whoopee cushion, while illustrator Sophie's was a colourful work of art. What do you think? We were seriously impressed with their unique creations - from Suzanne's chic monochrome seat, to stylist Fran's expertly accessorised piece (complete with retro badges). The 11 chairs will be on display at Bubble this February - and, if you like what you see, you could even take one home with you! We'll be putting them up for grabs in a silent auction, with all proceeds going to the wonderful OOTD. Fancy owning a stylish OOTD original? You can register for a ticket to the show here. 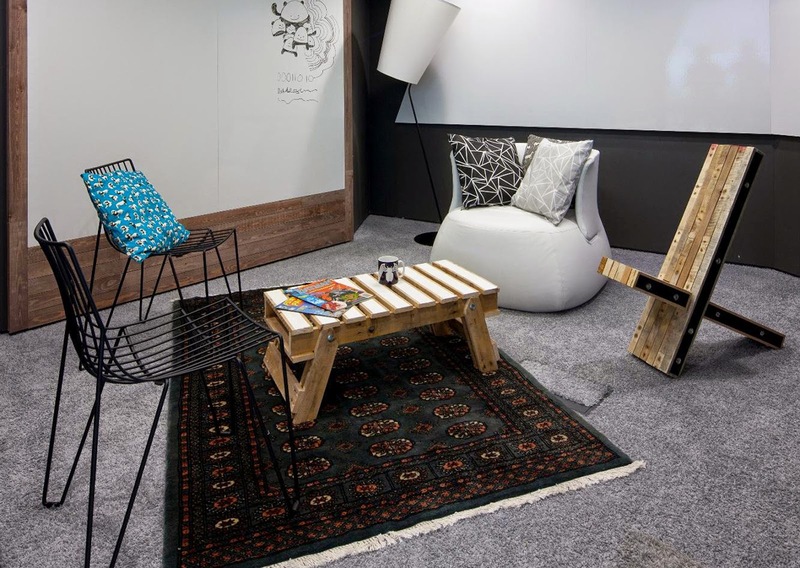 We've got our eye on that whoopee cushion chair, though..
Last year we told you all about Bubble London's new Perfect Pitch programme (which will give designers the chance to introduce their brands to an audience of visitors, Dragon's Den-style) - and now, finally, we can reveal who'll be taking part! Jam's stylish, durable childrenswear features adjustable fastenings and comfortable materials, making for a long-lasting fit. 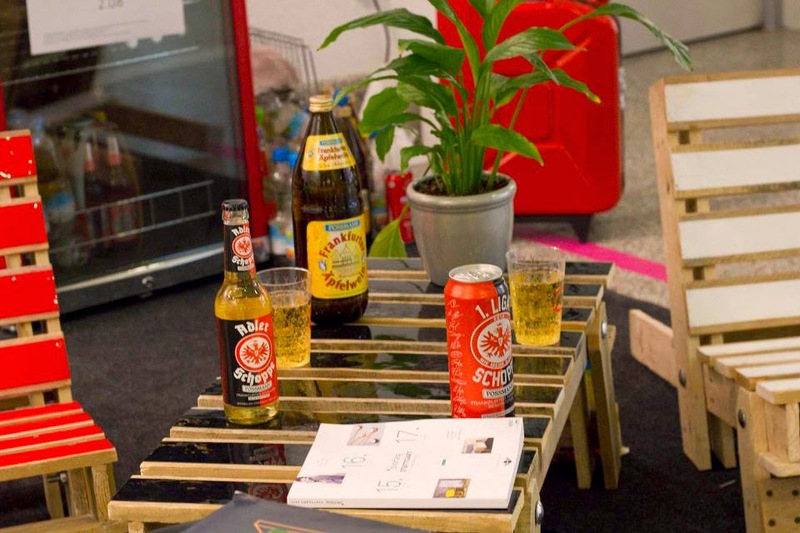 Premium lifestyle brand Storkwerk was founded by Anna Kraft and Chika Yamamoto Wolfson. The design-duo take inspiration from their own parenting experiences, creating innovative, stylish accessories - like the multi-functional 'Little Globetrotter' bib. Founded by Mona Alani, Homegrown brand Lola Myer specialises in classically-cut, vintage-inspired girlswear. Holly Hastie spent twenty year designing for the likes of Jigsaw, M&S, Kew and Etam, before turning her hand to childrenswear. Her creations are bold, bright and playful, recalling the elegant partywear of the 1920s. Holly and Beau was founded by brother-and-sister duo Jack and Fleur - who, fresh from university, decided to make 'welly wearing weather' more fun. Its swim-shorts, umbrellas and waterproof coats magically change colour when wet. Finnish brand Papu was founded by designer Anna Kurkela and artist Hanna-Riikka Heikkila. Each collection of cool, unisex Papu clothing is inspired by a different story, and features Hanna's unique graphic prints. Tweedy Gromett was founded by Julie, an 'unruly northerner' and former Great British Sewing Bee contestant. You can read more about her story, experiences and unique tweed babywear here. Inspired by their childhoods in New Zealand, friends Cat and E-J decided to create a range of Merino wool garments for kids - and Smalls was born. Its luxurious vests and base-layers are soft, non-itchy and uniquely warm. Oh...My! 's high-end occassionwear is designed by Anna Davies, who strives to create playful, functional clothing for 'stylish little ladies'. Its debut collection features pretty florals, full skirts and elegant fabrics. Mums Isobel and Penny founded Magnus & Mouse with a view to livening up dull cot-spaces. Their organic sheets and baby blankets are available in a range of chic, Scandi-inspired prints. If you fancy hearing more from these up-and-coming brands, you can attend one (or both!) of our Perfect Pitch sessions at the show. They'll be held in the seminar theatre, with each designer given five minutes to introduce their label. You might just discover your new best-seller! Apply for your free ticket to the show here. Julie, when did you decide to found Tweedy Gromett? Tweedy Gromett was created in May 2014, shortly after the Sewing Bee had been aired. While I was on the show, I was being constantly tweeted about the clothes I wore. The waistcoat I wore on the first episode received lots of comments, as it was a little different to the standard waistcoat. I actually adapted the pattern from a tennis dress! After I left the show I made my 5 month old grandson a tweed waistcoat, and lined it with London guards as his dad was from London. My daughter put it on Facebook, and everyone was liking it and asking where she had got it from. 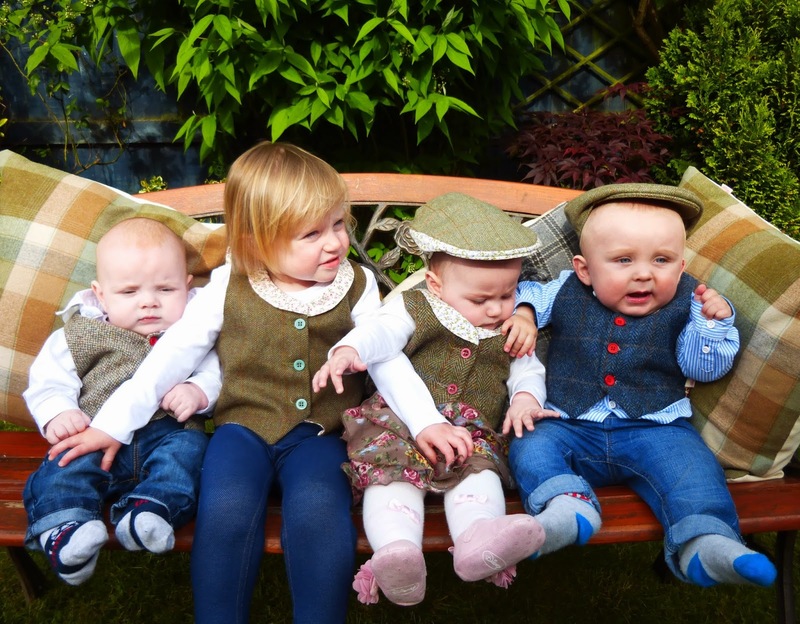 It then occurred to me that maybe there was a market for this type of thing.I did some research and found there was little or no tweed for babies or toddlers - mainly because traditionally, tweed is quite a harsh fabric. But if you choose a light weight tweed and combine it with a soft cotton, it is fabulous. Tweed is something I have always worn and I have always been a fan of country clothes, so it seemed the natural fabric to work with for me. What challenges have you faced in the course of launching your brand? The biggest challenge I have faced so far, is planning my year and keeping control of cashflow. As a new business, it's important not to get carried away with ordering stock and fabrics, and only spend what you can afford. Patience is a virtue and if you develop your business at a pace you can keep control of, it's much more likely to have a healthy bank balance and flourish. Did you enjoy your time on The Great British Sewing Bee? Being a contestant on the Great British Sewing Bee is something I will never forget. It sounds a bit of a clichéd, but we all really bonded and I now have friends for life. The highlight of the show was winning garment of the week in the very first episode, especially since it was silk and I hate working with silk. I'm lucky; I learnt to sew with difficult fabrics because my daughter was a ballroom dancer and I could never get a dress made on time - so being the Have-a-go-Harry that I am, I decided to make them myself. It was all chiffon and silk, so I was familiar with the difficulties silk poses. What advice would you give to someone launching a kid's brand? If I were to give one piece of advice to someone who was thinking of launching a kid's brand, firstly it would be, a) don't use tweed, that's my neck of the woods. b) Think of something you really love and whatever you decide to produce, somehow, use a little bit of that in it. Clothes made with passion are always better than a run of the mill production line. Every waistcoat or garment I design, I'm convinced it my favourite. Are you looking forward to Bubble London this February? I am so excited about Bubble London. Although I have had stands at all the big equestrian and country shows this year, this is my first trade show - so where better to display my goods than London! I am also very excited about the opportunity to present to buyers as part of the Perfect Pitch Programme. Some people think I am mad putting myself under pressure, but I just love an audience! Julie will be delivering her Perfect Pitch on Monday 2nd - stay tuned for the full line-up! 'Recycle more' topped our list of new year's resolutions - and, this season, we're taking tips from Gas&Air. February's show will be partly furnished by the South London company, which creates innovative tables, chairs and benches from reclaimed timber. And we thought our egg carton desk-tidy was impressive! Guy, how and when was Gas&Air founded? both carpenters and experienced and dedicated 'palleteers'. 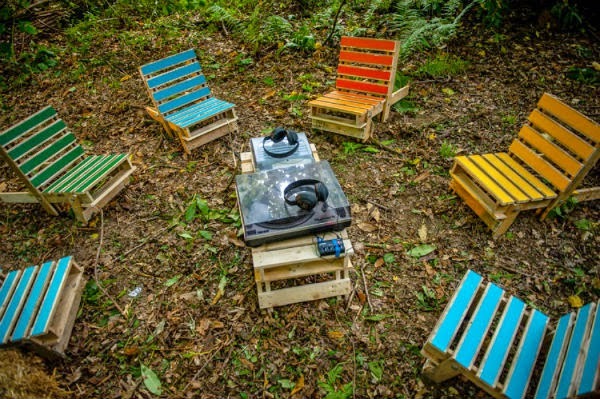 Where do you source the material for your pallet furniture? damaged or unwanted; we never use pallets that are new or due to be re-used. furniture, which we source from small business around London. What has been your most exciting project to date? exciting to see our furniture as part of the design. What are you looking forward to about Bubble London? Look out for Gas&Air's unique creations in and around the BDC at Bubble London A/W15! You can register for your free ticket here. Our A/W15 Rising Star finalists are a seriously talented bunch - and it's high time we introduced you to them! 1. Homegrown brand La Pitchoune creates exquisite couture dresses for little girls. Its founders, Loulou Bontemps and Gemma Smith, share a passion for fabrics, and source their silks and cottons locally. Expect classic silhouettes, feminine prints, and plenty of anglo-french elegance! 2. Holly Hastie is a bold new girl's brand, inspired by all things vintage - from Edwardian seaside photographs, to the partywear of the 1920s. Founder Holly spent twenty years designing for Jigsaw, M&S, Kew and Etam - and has now turned her hand to childrenswear. 3. If you recognise Magnus and Mouse, it might be because you read this interview with its wonderful founders, Penny and Isobel, last year! The mums-turned-designers create organic fitted sheets and baby blankets in chic, Scandi-inspired prints. 4. 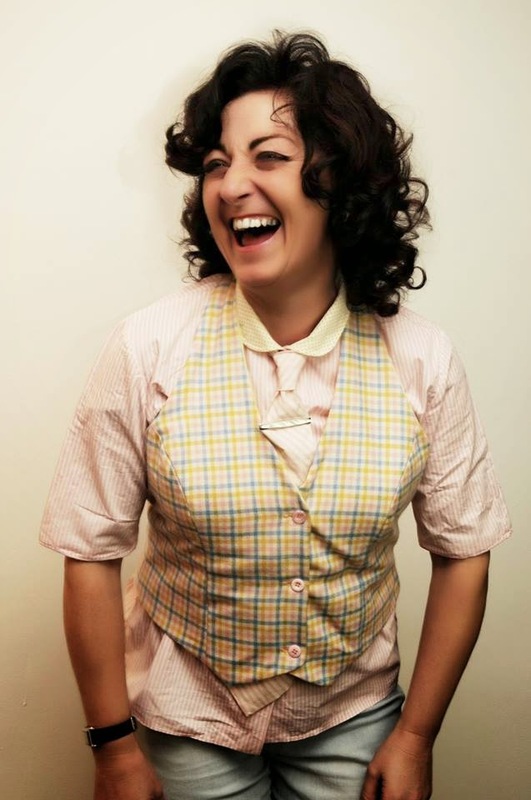 Tweedy Gromett was launched by 'northern lass' and former Great British Sewing Bee contestant, Julie Gromett. 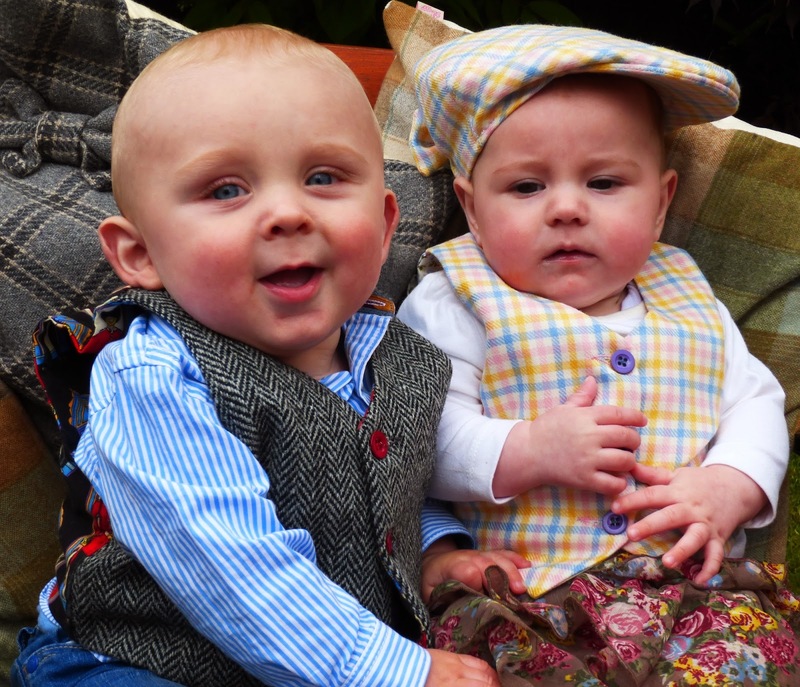 Working with local tailors, she creates unique tweed and cotton babywear - like these dapper waistcoats. 5. Founded by Anna Kraft and Chika Yamamoto Wolfson, premium lifestyle brand Storkwerk specialises in innovative, multi-functional parenting products. Its chic, contemporary bibs and bags have been designed with time-saving and efficiency in mind. 6. We've raved about Oh...My! before - and can you blame us? The British brand creates beautiful occassionwear for girls aged 5 - 11; think jewelled tones, high-end fabrics and on-trend prints. 7. Homegrown label Lola Myer takes its inspiration from the elegant fashions of yesteryear, creating classically-cut dresses with a modern twist. Expect plenty of sweet, vintage-inspired details - from peter-pan collars, to lace trims on its traditional bloomers. 8. Jam's stylish, durable clothing (think pretty floral dresses and comfortable dungarees) features adjustable fastenings - making for a long-lasting fit. 9. Mums Amanda and Judith loved bamboo, but were unable to find truly stylish kids clothing in the soft, naturally hypoallergenic fabric. Finally, they decided to create their own colourful collection of bamboo kidswear and accessories - and Panda and the Sparrow was born. 10. Jump Junior's knitted tank tops are colourful, lively and full of humour - just like the little boys they're designed for. Its first collection features a range of fun, retro motifs - from tractors and trucks, to traditional stripes. We'll be announcing the winner on Sunday 1st February. Fancy meeting this season's best new design-talent in person? You can register for your free ticket to Bubble London here!